Carpal tunnel syndrome is pressure on the median nerve -- the nerve in the wrist that supplies feeling and movement to parts of the hand. It can lead to numbness, tingling, weakness, or muscle damage in the hand and fingers. Carpal tunnel syndrome is common in people who perform repetitive motions of the hand and wrist. Typing on a computer keyboard is probably the most common cause of carpal tunnel. Other causes include sewing, driving, assembly line work, painting, writing etc. In carpal tunnel syndrome the numbness and tingling sensation of the fingers and palms are greatly relieved with homeopathy treatment. Once the symptoms cured he can work like normal person. In our Multicare homeopathy online treatment center peoples suffering from carpal tunnel syndrome have been benefitted using our advanced homeopathic treatment packages. 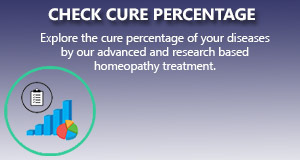 We apply the most scientific and research based homeopathy treatment package for carpal tunnel syndrome that gives a long standing improvement to the ailment.